Unsurprisingly, The Buzz has intended a post on bees since conception. And then, just a week ago Andrew Lang said he’d like to write something on bees. So I said, go for it. Not without first regaling him with the tale of my personal close encounter, when I was blessed with an impromptu hive for half a year or so. But that’s another story. This morning I went out to the garden, before the heat, to plant a few things that I’d picked up yesterday, at CERES Nursery. As I was planting my dill seedlings, I got stung by a bee that was foraging in my oregano. This was a good or bad omen, depending how you look at it. Maybe it pricked my conscience. Anyway, it hurt for a moment, as it does, and I put ice on it and the sting went away. Then I mourned the inevitable loss of a bee. I prefer to save them than be the vehicle of their death. Happily I can say, with memory and conscience intact, I have been stung by a bee exactly thrice in my lifetime, which means I have been directly responsible for the death of only three bees. In that time the agro-chemical companies have killed many, many millions of bees. Add to this global warming and, with the death of our bees comes the death of our food chain. So here’s Andrew, putting in to words my anger and sadness, and me putting into pictures my reverence for the tireless food production workers of the world. There will be differing opinions on which creatures act as the best and most sensitive indicator of changes in our environment. Some might say it is the dairy cow and her milk yield that best reflects the impact of rising temperatures, the availability of shelter, and food and water quality on a day-by-day basis. And it’s true that dairy farmers do get a quick hit to the pocket due to extreme heat and cold weather. There will be farmers of snails, frogs, oysters, earthworms, silkworms and medicinal leeches that would protest that it is their particular animal of interest that is most sensitive to changes in the environment. And, collectively, all of these creatures are important indicators. Just as alpine frogs and pygmy possums, Tasmanian Devils and other wild animals are indicators of what is happening in their environments. 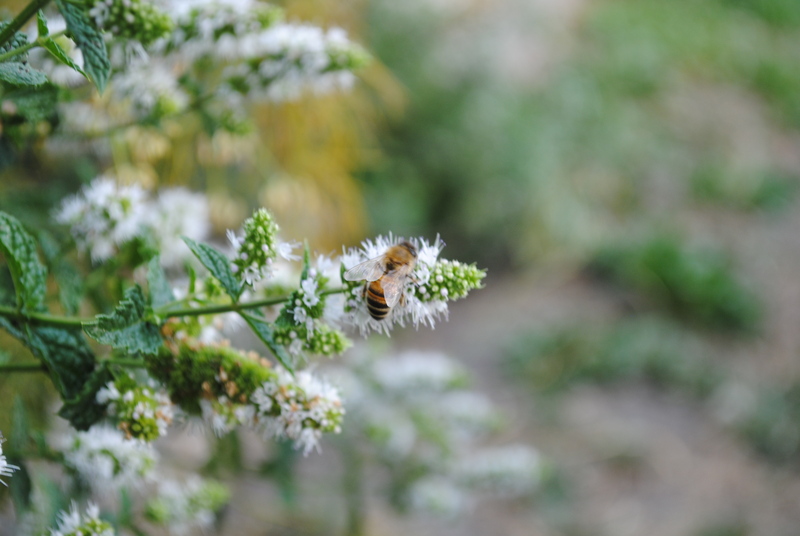 But of the creatures that we farm, it is the European honey bee that is the most sensitive to and best indicator of changes to a wide range of factors in our ‘modern’ world. These include sensitivity to changes in air quality, in nectar production in intensively-bred plants like canola; to the trace quantities of a range of insecticides, changes in flowering of wild plants year-by-year, and to a change that is of particular relevance – in atmospheric carbon dioxide (CO2) levels and rising average temperatures. Perhaps most important in respect to the issue of CO2 rise and global warming is the fact that at higher CO2 levels it has been shown that, while plant growth rates increase, protein levels in plant tissues, including in seeds and pollen, measurably decline. And bee life span is directly related to the protein content of the pollen that as larva they get fed on for about five days during their early development. 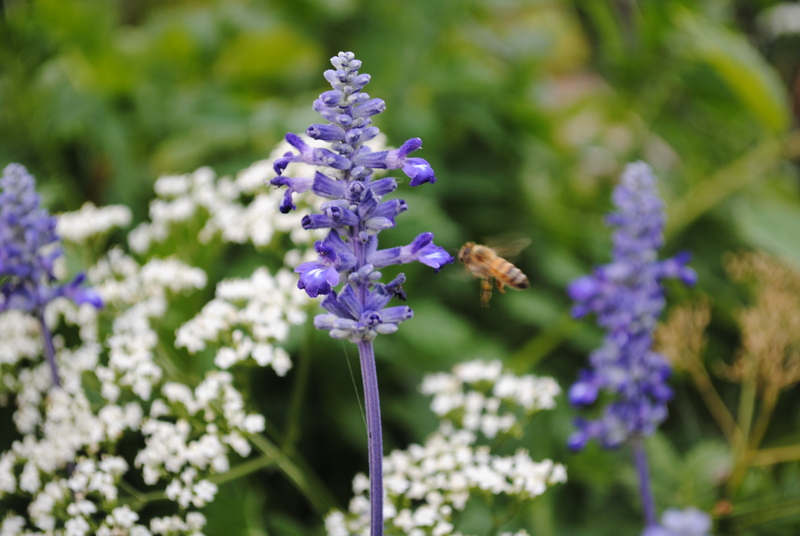 Bees that as larva were fed high protein content pollen live for up to 60 days, and bees that as larva received significantly lower protein content pollen live for as few as seven days. Added to this is the fact that while bees are able to keep hives and honey comb structure below a upper temperature and within a range of humidity by collectively fanning to drive air movement through the hive and maintain evaporative cooling, a prolonged hot spell (as happened in January 2014 in Victoria) can overtax this process. In January’s heat wave, up to 10% of hives across a wide belt of the state – from Mornington up to Seymour – had a melt-down of combs, with loss of honey, wax, and the resulting death of millions of bees. Just to put it all in perspective: modern agriculture and horticulture relies on insect pollination for most crops produced other than cereals. The Apiary industry says that bee pollination of food crops is responsible, directly or indirectly, for the production of up to 62% of the food we eat. This is now unhappily evident in those countries where bee populations have recently crashed, including in the USA. While it is a commercial practice to hand-pollinate glasshouse plants such as tomatoes, most species of field-produced plants are insect-pollinated. Among the common food production plant species it is only the flowers of members of the grass family – such as maize, rice, wheat, sugar cane and barley – that are wind-pollinated. 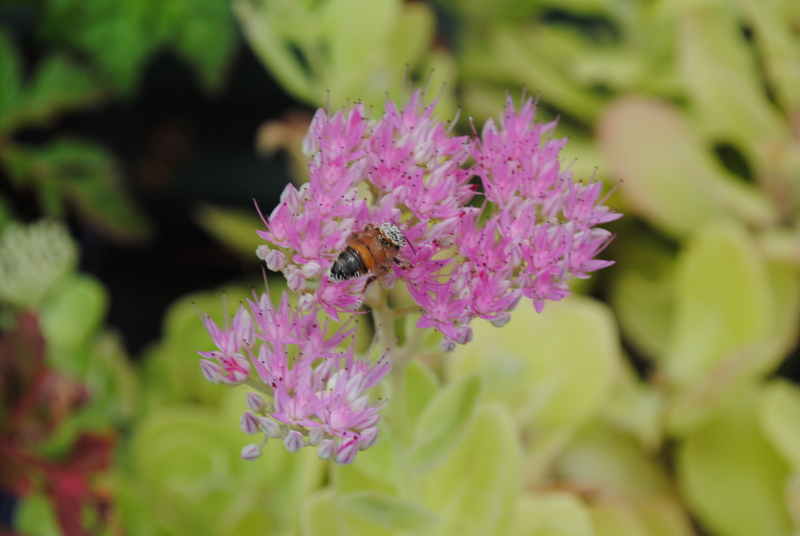 For some plants, honey bees – either feral or farmed – are considered to be responsible for up to 100% of pollination for fruit or seed production. These plants include onions, sunflowers, almonds, and avocado. Close behind, at about 90% reliance, are cucumber, mangoes, apples, asparagus, kiwifruit, rock melons, pumpkins, cherries and macadamia. 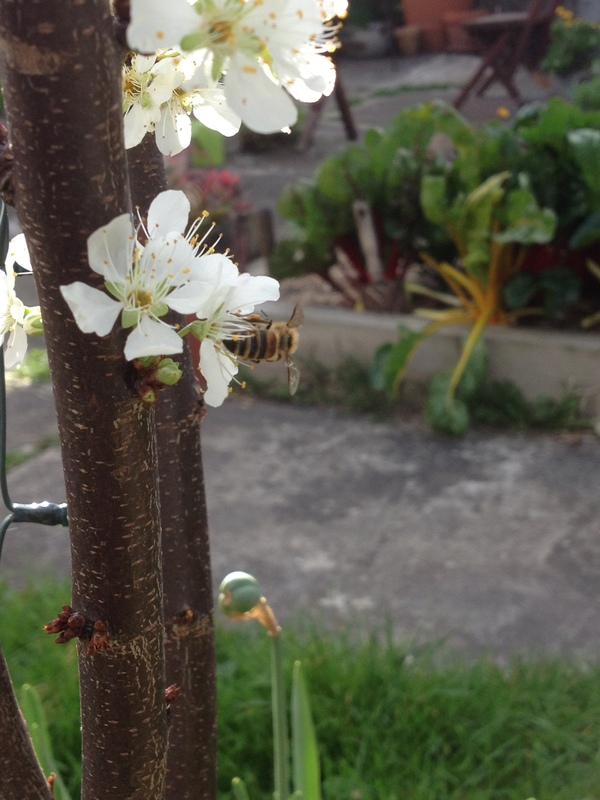 Apricots, water melons, other melons and plums are closer to 70% reliant on bees for pollination. The reliance goes down from around 50% for nectarines, peaches and pears, although it’s at 40% for berries, about 30% for canola and citrus, to 20% for cotton, and 10% for tomatoes and grapes. For many of these crops other insects obviously play the major role. 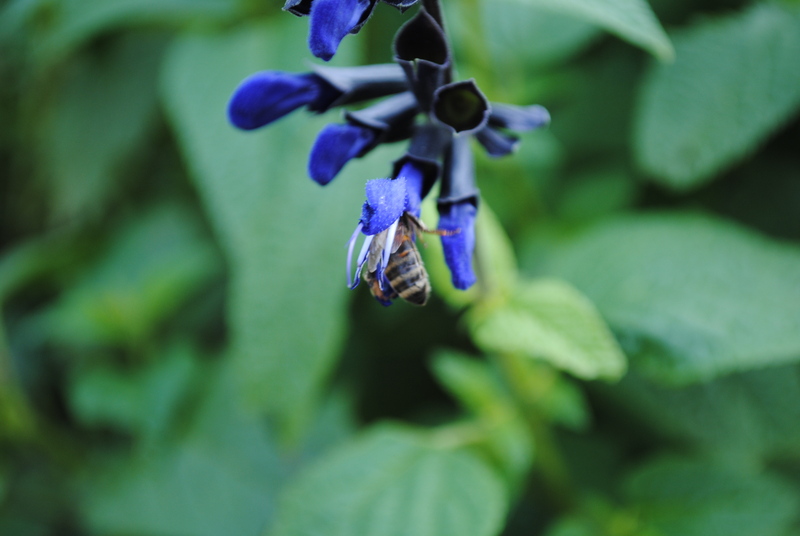 Pollen and nectar may not be adequate from a lot of these crops for adequate bee nutrition or build-up of honey stores. Also, remnant sub-lethal levels of some insecticides previously used on these crops affect the performance and lifespan of bees (not long-lived even in perfect conditions), and hives need to be regularly taken off to some place where there is a good pollen supply and an insecticide-free environment. Flowering native forest is usually best for this. So bees are critically important for productivity and prosperity across Australian agriculture and horticulture. The European honey bee was successfully brought out to Australia in about 1822 and quickly spread across the continent and acclimatised. Feral communities of the honey bee do the lion’s share of pollination in regions where they are common. But they can also be a reservoir of some problem diseases, and all bee keepers are constantly on guard here for signs of the diseases of foul and chalk brood. As if this, along with poor seasons for flowering in native forests, insecticide residues and low prices for honey are not enough, keepers are keenly aware that the insects that are decimating beehives around the world – Varroa mite and Asian mite – are only kept out of this country thanks to stringent quarantine measures. Varroa mite (aptly-named Varroa destructor) has killed off nearly all of the feral honey bee population in the USA and New Zealand, and in the USA it has reduced the commercial bee hives to perhaps 40% of their previous number, with a dramatic impact on pollination of commercial crops. 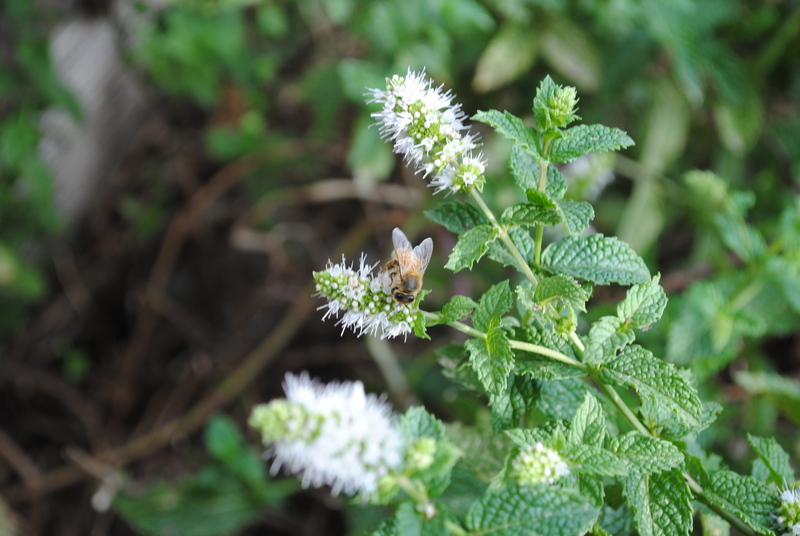 Asian mite, another nasty threat to bee health, is endemic in Papua New Guinea and is being controlled in the northern islands of the Torres Strait, while the Varroa mite is in bee populations in eastern Indonesia. It entered NZ on a ship in a swarm that was not detected by quarantine, which is how it could potentially arrive in Australia. So, adding global warming and rising CO2 levels, and restrictions on access to native forest to the numerous bee health perils is dramatically increasing pressure on beekeepers and affecting the viability of the industry in Australia, not to mention across the globe. For example, the number of commercial apiarists in Victoria has halved in the last 20 years, down to 228, and some of these keepers are in their 80s. So, next time you eat a cucumber, avocado or nectarine, just pause to think – it might be one of your last. 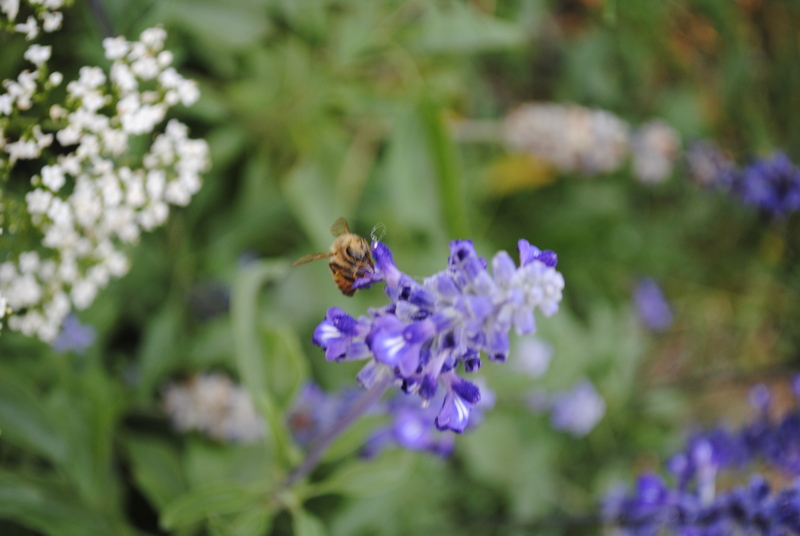 For a great website on bees, check out the Wheen Bee Foundation. And to follow the progress of maintaining bee health in Australia, there’s the National Bee Pest Surveillance Program. Editor’s postscript: Well, there’s a lot I could add, but I won’t. Andrew’s post gave me the chance to go out this evening, when I know that bees are still active, just before dusk, and take some bee photos. I do so adore the little blighters, and know that I wouldn’t have nearly half my food if they weren’t around. I guess I could add that bees need a water source, particularly during hot weather, so a pond or bird bath helps out with visitation and pollination a treat. But make sure they have somewhere to land, as they can’t swim. 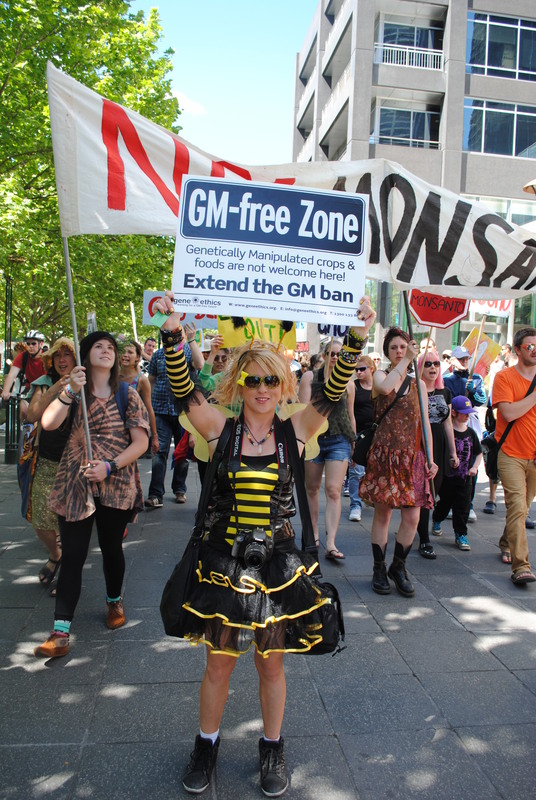 Also, on May 24th there is the now annual global March Against Monsanto, and my best Bee Girl and I will be there, amongst many others I hope.